On the other hand FW, I can remember the shortest conversation I ever had with Wayne. Wayne somehow got wind of the fact that Perry Clark was recruiting Leveldro Simmons and at the time he was under the recruiting radar because he was a 6-3 post player in high school and apparently Perry (quite rightly) saw his future as a big time D-1 guard. Welll all of a sudden Simmons began getting big-time interest from other programs and Wayne was worried and upset. I had no earthly idea who Leveldro Simmons was, but I would get regular calls from Wayne on the subject. Finally one night Wayne calls me frantically and says "I have to talk to you about Leveldro Simmons." I said "OK." Wayne said "I just don't know what's going to happen." I said "Well Wayne, I don't know either. " He says "Well I'm at PJ's and I have to go. Thanks for the info." Sorry guys but I need to share another Wayne story. So one night about 5 years ago my wife and I are having a dinner party. The phone rings, my wife picks it up and passes it to me rolling her eyes saying "It's Wayne". Not that she disliked Wayne, but because she knew I'd be on the phone for a week. Well, I missed dinner and dessert and 3 hours later I emerged to find a not happy wife and no guests. You know why Wayne called? He wanted to know how he could tell if something was kosher or not. This started a 3 hour conversation on how to tell if something was kosher and whether or not I actually believed that the little "K" or "U" on boxes of food meant they were actually kosher. He kept trying to get me to say I didn't actually believe it despite the fact that I told him 50 times that I'm not kosher, nor overly religious. Man, I miss him already. Ha, tell Jill I can one up her rolling her eyes. The spring/summer of 2003, when I was finishing law school/sudying for the bar exam, my roommate at the time called Wayne, "Wayne the Stain" because he was like a stain on our caller ID he called so much. Yeah, I remember you calling me once when you were driving Wayne around New Orleans looking at possible sites for a football stadium. This had to be 5-6 years ago, before the review. It's almost like all of these memories are coming back to me now after I hadn't thought about them for years. Maybe I convinced myself he was going to pull through, if just so he could see how Tulane did this year in whatever sport. He was a great guy and fan. 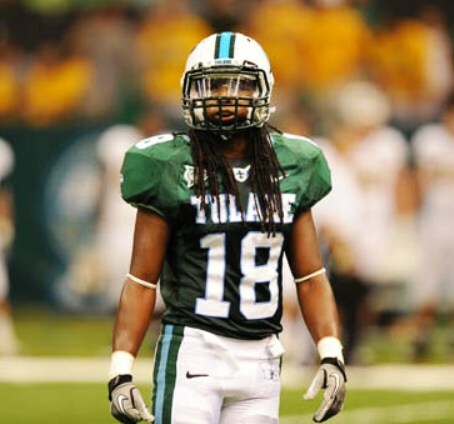 A sad time indeed for all of us in the Tulane family. Rest in peace my old friend. lol...that was pretty funny. He refered to almost everyone by their board handle, but he loved calling you sprout. It got to the point where I would have to tell him someone's handle so he would know who i was talking about. Except for you Seth, for some reason he never called you FW...what was that crazy last name he had for you when you wrote baseball stories for him one year? I thought he was going to pull through just to finish his search for the football stadium site. I had forgotten about us doing that until you mentioned it, but ya, it was definitely before the review, because it was while I lived in NOLA. He strongly felt we needed out own stadium to ever get on financial solid ground...and he's probably right. A sad day. Wayne was, and probably always will be, Tulane's #1 fan. Unlike many on this board, I never met Wayne and only knew him through the internet. Nonetheless, I will miss him. Even my wife knew who I meant when I'd tell her that "Wayne said...(whaever)" He is in a better place. Post subject: Wow, this is great stuff. What a way to be honored! Wayne put the "C" in character. He was one of a kind. Last night, I told my wife he passed away. Like FW, we used to speak by phone quite a bit at home. She was blown away that he passed on and felt a sense of loss. Doc's stories bring back such great memories of his group constantly harrassing the refs and opposing teams at basketball games back when I was a kid. They were the original Cameron Crazies. Loud, proud, and quite witty. I found that Wayne was quite a realist about TU athletics. As time went on, he became more of an optimist as to our future. I think the combination of overcoming the review and RD, helped him feel more at ease. That better days were ahead. Here's to you Wayne. I'll miss seeing you ride your bike around Uptown and your presence at your office(PJ's coffee). I'll miss your passion for Tulane and your always astute observations. I'll miss your friendship and phone conversations. May you rest in peace friend. I had forgotten that, HA. I do remember but I can't remember what he called me. I know he used to call my by the names of different European Saints. His favorite was St. something but he called me St. Aubrey. I don't think there was a St. Aubrey but this was around the time Aubrey played for us. It was one of those Wayne things and I never asked. Last edited by FW on Mon Mar 10, 2008 10:34 am, edited 1 time in total. I remember when I was a student I would always see Wayne in the student section at basketball games, both men's and women's, with all his notebooks and papers and I was wondering, "Who is this guy?" It wasn't until a few years later when I got on the internet board that I learned who he was. May he rest in peace and enjoy unending days of watching over Tulane Athletics. Oh man, I can't stop. One other thing. When you were having one of those conversations with him, especially the long ones, he'd ask you some off the wall question and in the middle of you answering he'd say "Gotta go" and hang up. My wife would aks what happened when he'd do that. She finally got used to it. Yeehaw, saniflush!! I'm so sad to see Wayne is gone. He is one of the things I missed most about New Orleans. I probably got introduced to more things New Orleans by Wayne than I found on my own growing up in Old Metairie (Cazamento's, PJ's on Magazine, that Pizza place on Maple, Reginellis, etc.). Wayne and I met outside Fogleman when i was in college 18 years ago. I remember uploading his comments on his old site on Clever. I remember helping set up the Sportsonly board because it gave us more control over the posts (rather than just flushing the entire board when it got bad). Man, I'm going to miss him, gotta go bye. Eat their hearts, drink their blood! Did Wayne hang out at the PJ's on Magazine by Jefferson Ave? Was he a little on the chunky side? I think I may have met him after all if that's him. Thanks Donny Z. I am sorry that you lost such a great friend. Anyone have a pic of Wayne? I am sure I met him but I am horrible with names, faces I remeber, names- not so much. Seth, that's another great one. He had that answering machine that talked about St. Aubrey and the one when he was on the phone that talked about goats and ghosts on a battleship...i never understood either of the messages and he never identified himself as Wayne, but clearly no one else had those messages on his answering machine. I remember going with him to PJ's on magazine when I picked him up for a game onetime and he pointed at one of the girls who was working behind the counter who he had made friends with (I think he knew everyone in that place) and later told me that was the "original St. Aubrey." He always called me Meachem for some reason; apparently he thought that was my name when he first met me. I never quite got the Sani Flush routine. I do however, remember the "ref eats s---" incident like it was yesterday. I assume whoever posted that was someone I know. If we had another basketball game we could have a group heckle in his memory. My first recollections of Wayne were also very memorable. He use to heckle the one-eyed ump (who's name escapes me) by yelling CYCLOPS. I would lmao. He topped that - the one-eyed ump's son played left field for Nicholls State. When he misplayed a routine fly ball, old Wayne yells "SON OF CYCLOPS"! That was classic Wayne. Get well big guy. We need you at the Turch when the tiggers come to town.